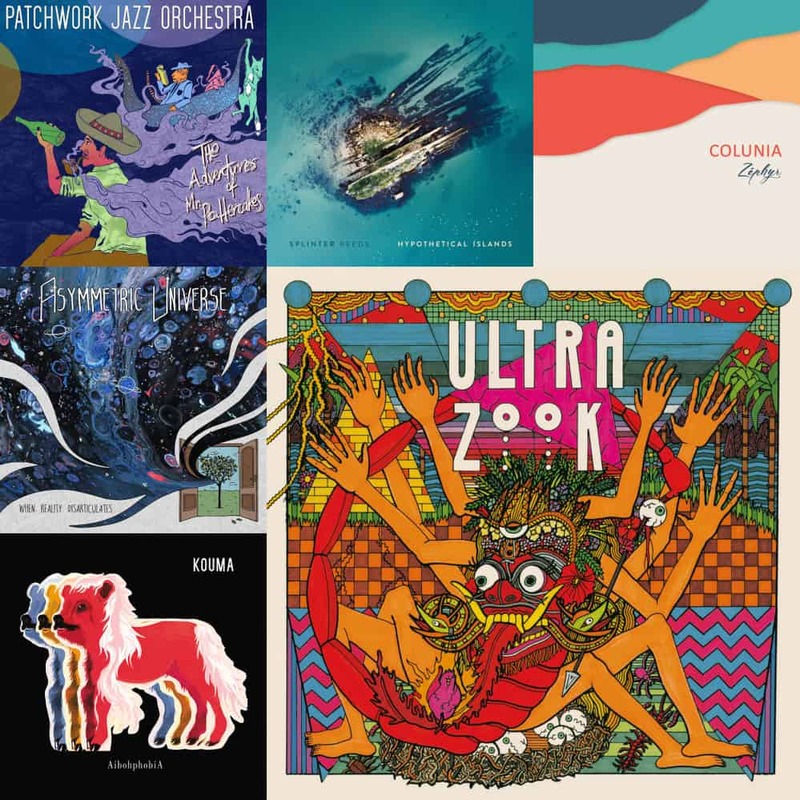 The London-based seventeen-piece big band Patchwork recently released their debut album, The Adventures of Mr. Pottercakes, via the lovely Spark Label. The compositions here are lush and broad in styles, thanks to the seven composers behind them and the musicianship of the performers in this great jazz orchestra. The songs are at times romantic, at times evocative, impressionist, or abstract. Listening to this is pure pleasure, for its varied and well-groomed influences and stylistic choices. Plus, at over an hour of material, you’ve got quite enough to get your fill! New Focus Recordings continues its support and curation of amazing contemporary classical music with Splinter Reeds‘s Hypothetical Islands, an incredible debut album. With the neck-breaking opener “Length and Line”, the album shows its vivid colours. Complex, multi-layered compositions, requiring extreme precision from the performers, are being displayed here, all penned by a different author. While the aforementioned track was a dizzying assault on the mind, the last on the album, the eponymous “Hypothetical Islands”, is much more atmospheric, almost ambient. Nonetheless, the brain juice keeps flowing, thanks to a myriad of compositional and instrumental techniques, advanced and tastefully arranged. Marvellous album, to say the least! With a vast array of influences—from Indian konnakkol to Balinese gamelan to name only two—the French Colunia quartet, sprouting from the Spatule collective carves its name into my mind for certain! Zéphyr, the entity’s debut effort, highlights the formation’s peculiar instrumental line-up, consisting primarily of harp, saxophone, double bass, and drums. This is not too dissimilar to Green Dome, which was also a blast to listen to. Zéphyr is a highly memorable album that keeps on giving. The world is seemingly an inexhaustible well of mind-blowing metal fusion artists, the latest of which on my list are part of the Italian Asymmetric Universe band. The musicianship on display is on par or better than the best in the genre, with a Breweresque bassist, a Pliniish guitarist, and a Garstkan drummer, you’ve certainly got a recipe for success. Their EP is merely three songs long, with an additional introduction that brings the number of tracks to four, but these tracks are all highly potent and incredibly satisfying to listen to. These guys have a bright future ahead of them! With their previous albums, Epuz, Epuzz, and Epuzzz, the French avant-garde madmen Ultra Zook showed great promise, even if some aspects of their music were in need of improvement. I’m glad to say that, with their debut full-length, L’album—or, eponymously, Ultra Zook—most or all the improvements I advocated for have been fulfilled. As a short descriptor, I’d say they are like a more psychedelic Ni, playing music for a kids’ show of the future. I highly recommend grabbing this incredibly good album if you have the chance. It’s coming out on March 22. Yes indeed, French label Dur et doux never ceases to impress. After Ultra Zook, let’s take a look at Kouma, a new contender for me, and one that is there to remain. As the album title suggests, Aibohphobia is all about palindromes. This is reflected by the two only tracks, “Aller” and “Retour”, which, together, spell out the French term “aller-retour”, a “round trip”, “there and back again”, “return ticket” for English speakers. Both tracks are exactly 13:37 long and, while I haven’t delved into their composition, I’m ready to bet that it is at least somewhat palindromic in nature. As for their sound, Kouma is an interesting mix of noise rock, polyrhythms, post-rock, droning notes and passages, and the complexity and idiosyncrasy of avant-prog. A terribly good album, out on the 29th! On	March 16 2019, this entry was posted.